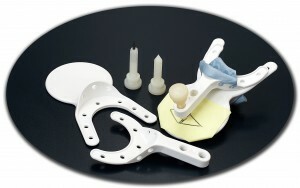 The GAT™ is an extra-oral “gothic arch” bite recording & registration system that provides a precise recording of the patient’s range of mandibular movement. According to the Simply Dental homepage, the GAT™ is suitable for use with all oral appliances treating snoring and sleep apnea, and any other dental procedure where precise recording is desired. The completed tracing becomes an important part of the patient’s dental record. It is important to know where the patient is positioned, both at the beginning and throughout the time of treatment. The Halstrom Hinge allows you to know precisely where the mandible is positioned at all times. With the GAT Gothic Arch Tracing you start the process with a detailed examination of both the protrusive range and lateral excursions. This information not only can impact device design and therapy protocol, but does as well serves as a important record. Our GAT Gothic Arch Tracer is advantageous no matter which appliance you are using. Includes instructional video covering technique for GAT™ and Silencer® Professional.